This month's 'Meet the Team' feature focuses on our Senior Arboricultural Consultant, Sebastian Onslow MICFor (Chartered Arboriculturist). We sat down and asked him a few questions…. Are you looking for a new opportunity for 2019.............We are looking for an enthusiastic person to work in our land team. Wharton Natural Infrastructure Consultants Ltd is based in Alcester, Warwickshire with a second office in Macclesfield, Cheshire with clients across England and Wales. This position is to work in our Alcester office. Are you looking for a new opportunity for 2019.............We are looking for an enthusiastic person to work in our ecology team. Wharton Natural Infrastructure Consultants Ltd is based in Alcester, Warwickshire with a second office in Macclesfield, Cheshire with clients across England and Wales. This position is to work in our Macclesfield office. World leaders and top CEOs are meeting in Davos in Switzerland from January 22 to 25 to discuss how to steer policy amid worries of slowing economic growth, damaging trade wars and Brexit. Environment Secretary Michael Gove today announced plans to create greater protections for trees in urban areas. The proposals would ensure councils can’t cut down street trees without first consulting communities. The measures reflect the important role trees in towns and cities play in improving our health and wellbeing, as well as providing crucial environmental benefits. Launching a consultation on a raft of new forestry measures, the Secretary of State unveiled proposals designed to ensure local people have a bigger say over what happens to the trees in their communities. It’s right that the views of local people are at the heart of any decision that affects their community – and the futures of the trees that line their streets are no different. Trees have often been rooted in our towns and cities for many years, and are undoubtedly part of our local heritage. These measures will enhance the protection given to urban trees, ensuring residents are properly consulted before trees are felled and safeguarding our urban environment for future generations. Urban trees are an amazingly valuable natural resource, and with this consultation I hope we can take further steps towards strong and robust protections to ensure their futures. By planting the right trees in the right place we can ensure that they continue to improve health and wellbeing and encourage people to enjoy the outdoors. The Forestry Commission recognises that our trees and woodlands are under increasing pressure, especially in and around urban areas. With this consultation we hope to be able to better protect more of our cherished woodlands from illegal felling. This consultation forms part of the government’s ongoing work to protect and promote our precious trees, including our commitment to plant one million trees in our towns and cities in addition to eleven million trees nationwide over the course of this parliament. Protecting and planting more trees is a key part of our ambitious 25-Year Environment Plan, which will ensure we leave this environment in a better state for the next generation. Following the completion our company rebranding earlier in 2018, we ware pleased to present to you our new company brochure. This is available as either a PDF or hardcopy on request. 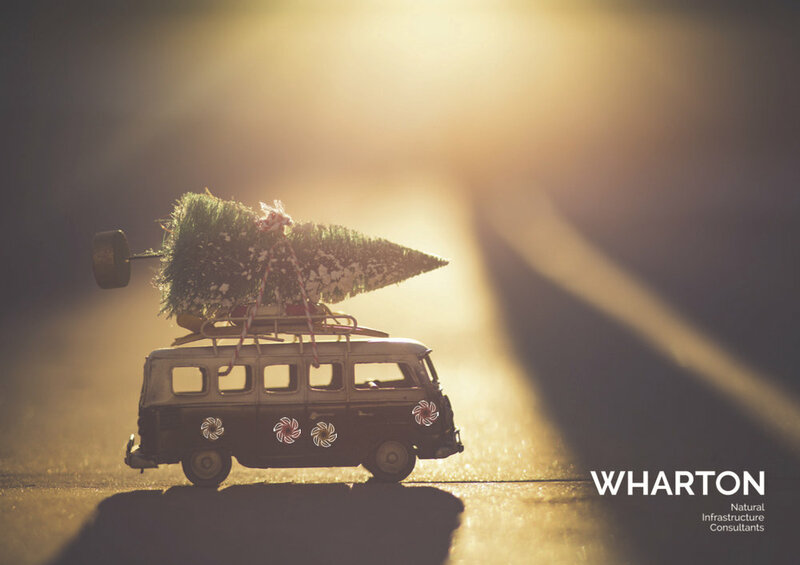 Merry Christmas & a Happy New Year form the team at Wharton Natural Infrastructure Consultants. We look forward to working with you in 2019 on a variety of projects. 2018 has been a big year for the company and we look forward to further growth in 2019. We hope you have a great break and come back fresh and ready for 2019. Hopefully you have also received your desk calendar to help you plan your projects. The office will be closed from Friday 21st December until 2nd January 2019. On Thursday 14th December we were thrilled to receive the news that both Sebastian Onslow and Jack Barnard had earned Chartered status in Arboriculture by achieving Professional Membership to the Institute of Chartered Foresters. Both Sebastian and Jack have work extremely hard to gain their Chartered status. This is a fantastic achievement and one that is truly well deserved. Starting from the home of UK Arboriculture, on the edge of the Severn estuary in Gloucestershire, at around 2.30am on a cold, and likely wet and windy morning on Thursday 6th December, four fearless Arboricultural Association (AA) members will be riding to the Houses of Parliament to deliver the biosecurity message in person at the official release of the AA’s Guidance Note: Application of Biosecurity in Arboriculture. Storms are on the increase…we need to be more aware and more prepared for the damage that can arise as a result. Matt Wall awarded his Class 2 Bat License! Congratulations to WNIC's senior Ecologist Matt Wall, who has been awarded his Class 2 Bat License by Natural England. This has come after a number of years of hard work and is a great way to start the week! By having this licence means that Matt can now survey bats using artificial light, endoscopes, hand and hand-held static nets! Well Done Matt! Join Peter Wharton at Venture House Business Centre, Stratford upon Avon, on 12th September for Donut Time where he will be giving his tips on Going Green for Wellbeing. Book now as spaces are limited! Serving you better by expanding our operational reach! 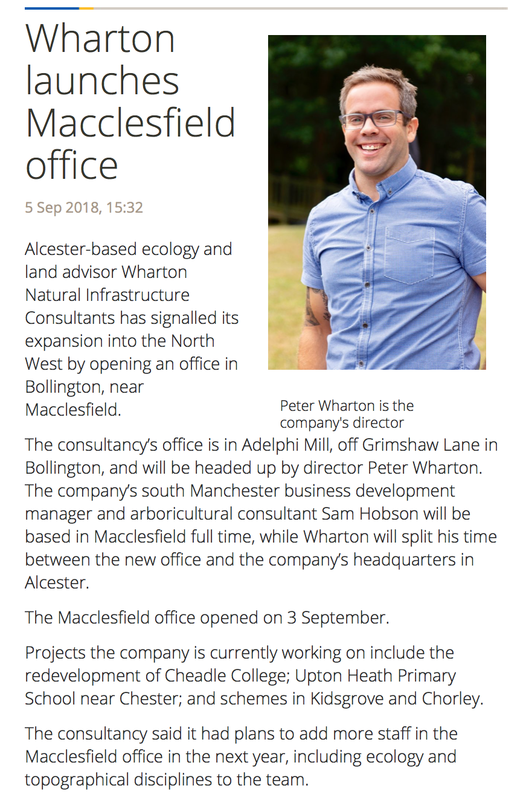 Wharton are getting ready to better meet your tree, ecology and land requirements by opening a new office in South Manchester in celebration of its 10th Anniversary this month. Trees and Design Action Group (TDAG) has produced an exceptional guide to assist decision makers and specifiers - Tree Species Selection for Green Infrastructure: A Guide for Specifiers freely available online.